The complete collection of episodes of the popular US biker drama. The story follows the lives of the SAMCRO crew as they find themselves involved in gangs, gun violence and deals with corrupt politicians. 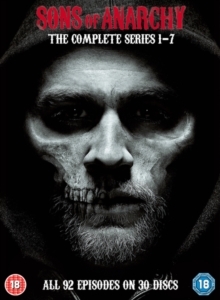 The group has to deal with threats to its authority, as well as internal tensions, such as the ever-growing doubts of its deputy leader, Jax (Charlie Hunnam), about the gang's role in the town. Season 1 episodes are: 'Pilot', 'Seeds', 'Fun Town', 'Patch Over', 'Giving Back', 'AK-51', 'Old Bones', 'The Pull', 'Hell Followed', 'Better Half', 'Capybara', 'The Sleep of Babies' and 'The Revelator'. Season 2 episodes are: 'Albification', 'Small Tears', 'Fix', 'Eureka', 'Smite', 'Falx Cerebri', 'Gilead', 'Potlatch', 'Fa Guan', 'Balm', 'Service', 'The Culling' and 'Na Triobloidi'. Season 3 episodes are: 'So', 'Oiled', 'Caregiver', 'Home', 'Turning and Turning', 'The Push', 'Widening Gyre', 'Lochan Mor', 'Turas', 'Firinne', 'Bainne', 'June Wedding' and 'NS'. Season 4 episodes are: 'Out', 'Booster', 'Dorylus', 'Una Venta', 'Brick', 'With an X', 'Fruit for the Crows', 'Family Recipe', 'Kiss', 'Hands', 'Call of Duty', 'Burnt and Purged Away', 'To Be, Act 1' and 'To Be, Act 2'. Season 5 episodes are: 'Sovereign', 'Authority Vested', 'Laying Pipe', 'Stolen Huffy', 'Orca Shrugged', 'Small World', 'Toad's Wild Ride', 'Ablation', 'Andare Pescare', 'Crucifixed', 'To Thine Own Self', 'Darthy' and 'J'ai Obtenu Cette'. Season 6 episodes are: 'Straw', 'One One Six', 'Poenitentia', 'Wolfsangel', 'The Mad King', 'Salvage', 'Sweet and Vaded', 'Los Fantasmas', 'John 8:32', 'Huang Wu', 'Aon Rud Pearsanta', 'You Are My Sunshine' and 'A Mother's Work'. Season 7 episodes are: 'Black Widower', 'Toil and Till', 'Playing With Monsters', 'Poor Little Lambs', 'Some Strange Eruption', 'Smoke 'Em If You Got 'Em', 'Greensleeves', 'The Separation of Crows', 'What a Piece of Work Is Man', 'Faith and Despondency', 'Suits of Woe', 'Red Rose' and 'Papa's Goods'.